When I posted that I got a ton of questions about how I did it. So that is what I'm going to show you in today's video. If you're like, ‘omg, I don't even have a website yet,’ don't even worry. Building websites is what I teach over at solopreneursidekick.com. If we haven't met yet, hi, I'm Louise. I put out new videos every single week, all about making the tech in your online business easier. So if that is something you could use a little bit of help with, subscribe to my YouTube channel here. The first thing you need to do is download the Chrome extension Full Page Screen Capture. Once downloaded, click add to chrome and then add extension. Now you'll see it has been added to the tool bar at the top of your Google Chrome browser. Next you need to go to your website. Click on the icon for the Full Page Screen Capture Chrome extension. This will take a screenshot of your entire website. Download the image as a PNG. Now you should have your screenshot ready to go! Please note - if you have parallax on your website you might need to edit this image. If an unwanted grey bar shows up in the image, simply edit it out using Canva or Photoshop. The next step is to find a computer graphic to use. For this, let’s go to my favorite graphic design tool for non-designers, Canva. It’s totally free and you can sign up for an account and get started straight away. Click custom dimensions in the top right and type in the dimensions 2000 by 2000. Make sure this is px (pixels), and then click create new design. 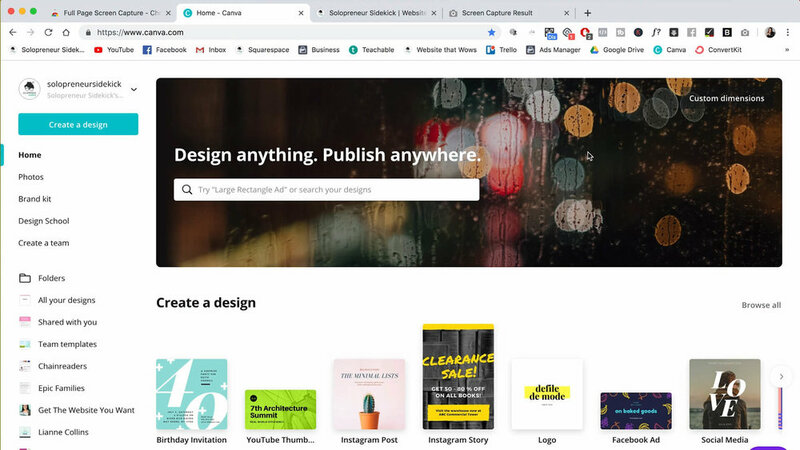 Now the next thing we're going to do is go over to elements and then graphics and type in “computer mockup.” Canva has all of these different computers that you can choose from. Some free, some are just $1, so totally worth it I think. Once you have your graphic, download as a PNG. Now for this next step, we are going to need to use Photoshop. I rarely get you guys to use Photoshop in my videos, but for this one we will need it. You can sign up for a free seven day trial to use it. And don’t worry, this is a super easy function! Click open on the left hand side and find your computer graphic that you just downloaded from Canva. Once you have opened the graphic in Photoshop, find the magic wand tool which should be towards the top of the tool bar on the left hand side of Photoshop (it’s a little wand with some stars around it). If you cannot see the magic wand tool, go to to the top of the screen, select window, workspace and essentials. You can also use the keyboard short cut W.
Photoshop does have tools grouped together, so it may select the quick selection tool - just find the selected tool on the tool bar on the left, click and hold on the tool and it will show you the other tools grouped with your current selection. Here you can choose the magic wand tool. So what we've done is make this area in the middle transparent so that we can add our animation behind it. Click file, export, quick export as PNG and save. Perfect. This is going to allow us to put our animation in there. Next we need to use Keynote, which is my favorite tool ever, and I'm now realizing how much I use this tool. I seriously have it open every day! Drag your mouse over those text boxes and delete those. Head over to the top right where it says document, click that and then go down to slide size. We need to change this. So go to custom slide size and change this to 2000 by 2000. 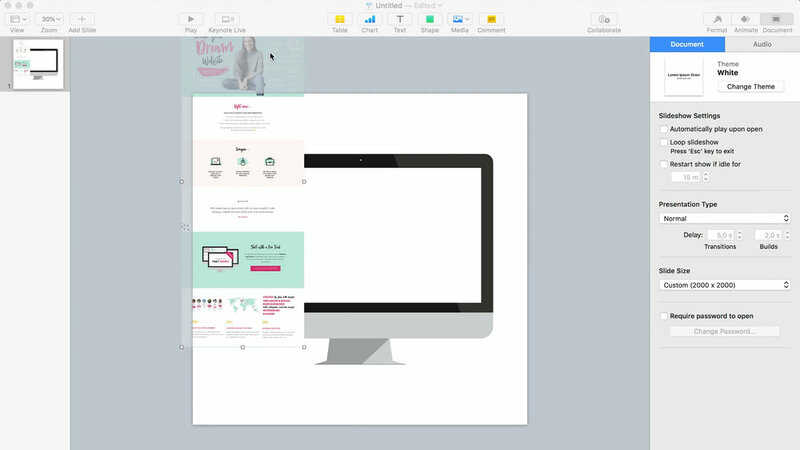 Now drag the computer mockup that you created in Photoshop into this Keynote document. And then you need to drag in your screenshot of your website that we took in the beginning. Now what we need to do is grab our screenshot of our website and resize it to fit inside the laptop screen. Now go over to format, then arrange and click back. So that's going to fit it in our computer graphic and it will look just like a computer screen that has opened up to your website. Finally we need to add the computer scroll animation. Click on your screen, then go over to animate action, add an effect, and add move. You're going to go over to the small white box on the right end of the line and just drag this back on top of the small white square on the left. Next, drag it up in a straight line to determine how far you want it to scroll up on your site. Then change the duration to four seconds. Now click preview to view your computer scroll animation. To export, click file, export to movie, change both of the self-playing numbers to zero, change a resolution to custom and change this to 2000 by 2000 pixels. Finish it off by clicking next! Well done. Your animation is done! Go ahead, share this out on social media and celebrate your website launch. If you do not have a website yet, I have an amazing online course that will help you quickly and easily build your website and right now, you can try it for FREE. I hope that you really enjoyed this tutorial. Definitely let me know your thoughts in the comments below. Don't forget to hit subscribe on my YouTube channel for more and I'll see you soon with another tech tutorial.